The 6.5x25 CBJ Spoon Tip is exactly the same as the Ball cartridge except that the projectile has a spoon tip, which is a small spoon-shaped asymmetry in the tip of the bullet. 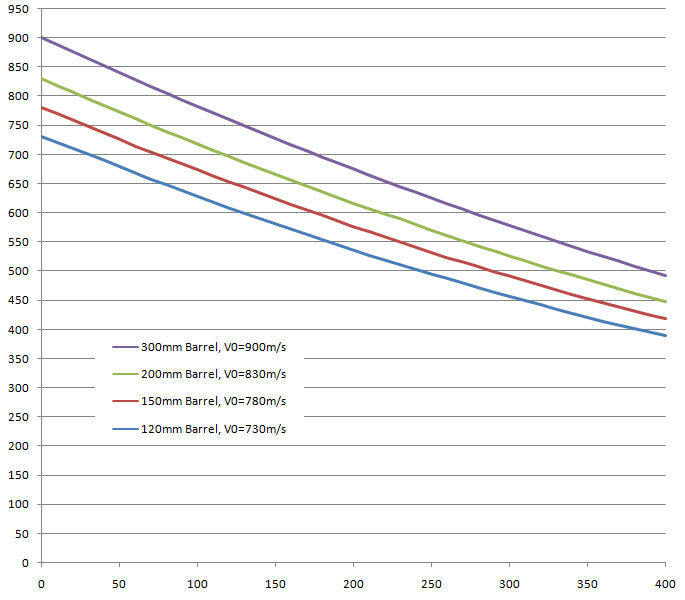 It affects neither the outer ballistics nor the penetration capability. 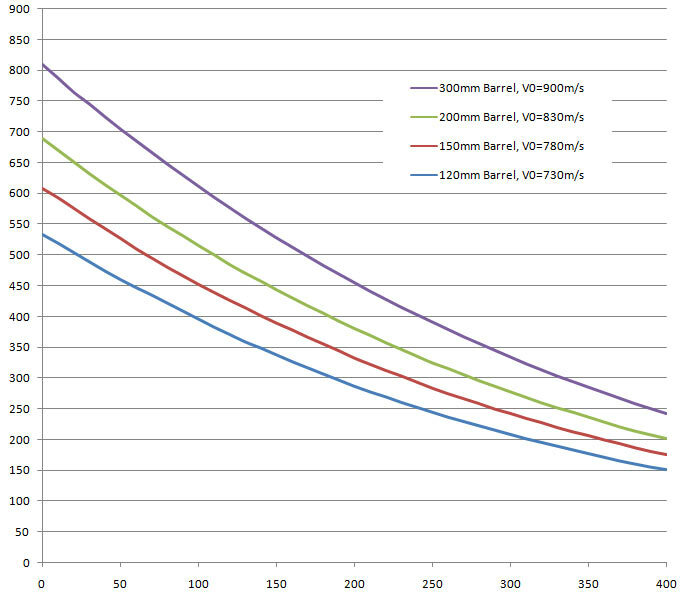 This gives an earlier cavitation, though overall damage is not increased. 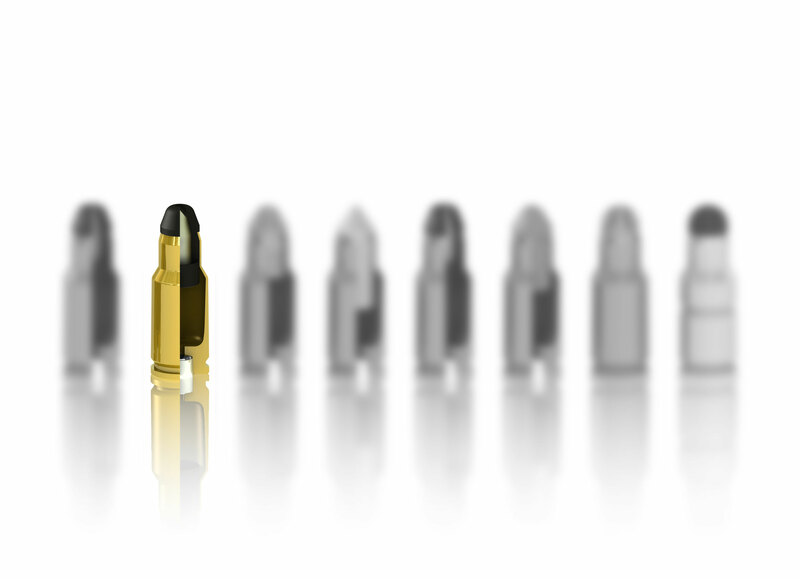 The 6.5x25 Ball and ST works reliably in less-than-ideal impact situations, for instance when the bullet has been caused to tumble before reaching the target. This would be the case when the target is behind barriers, thick foliage etc. The picture shows the test results of a composite test with the 6.5x25 CBJ ST where the scenario is that the target has body armor (NATO CRISAT) and sits in the front seat of a vehicle. The car windshield was placed 45cm in front of the CRISAT protection and gelatin block, and inclined 45° vertically and 15° to the left. 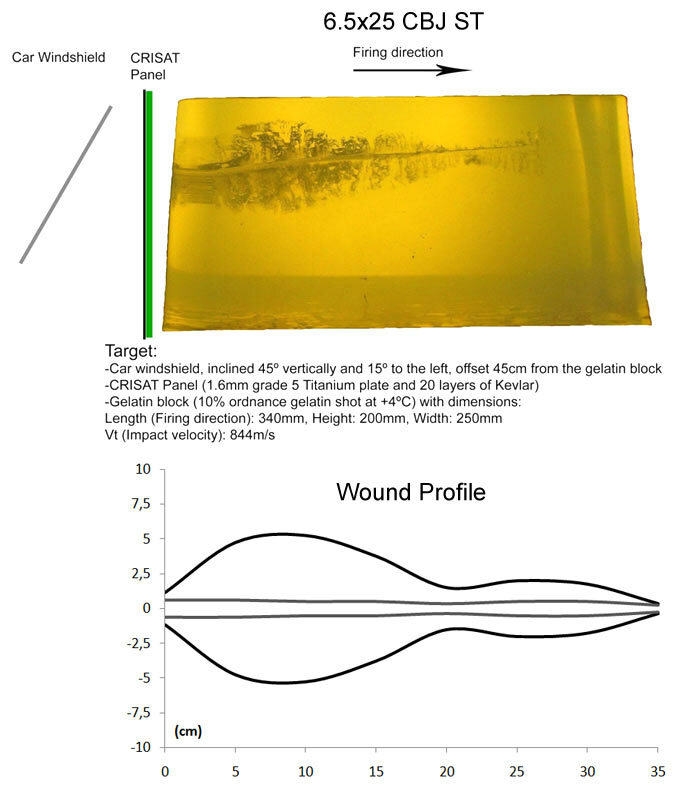 Even though the windshield caused the bullet to tumble and impact the body armor sideways, the body armor and gelatin block (340mm) were fully penetrated with a substantial energy transfer to the tissue simulant. 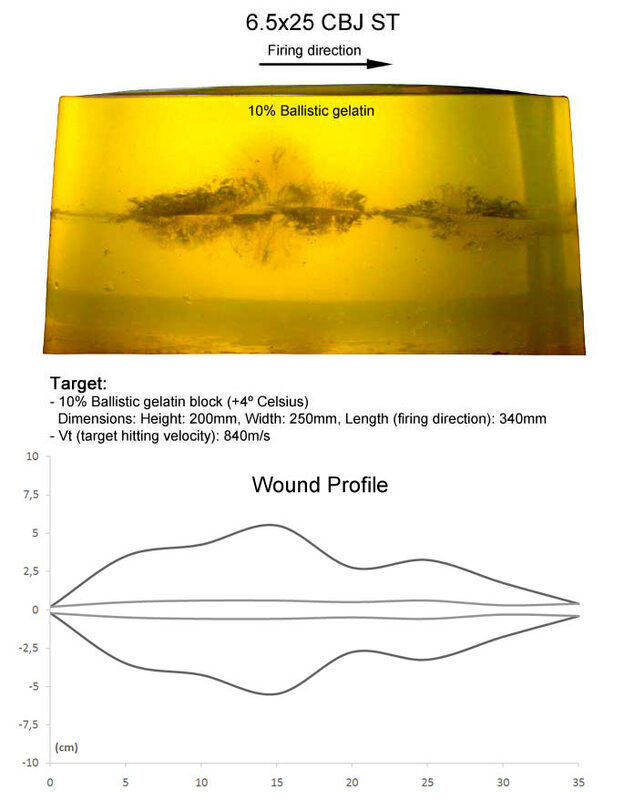 The test result of the 6.5x25 CBJ ST when fired at bare gelatin is shown here with the corresponding Wound Profile below. 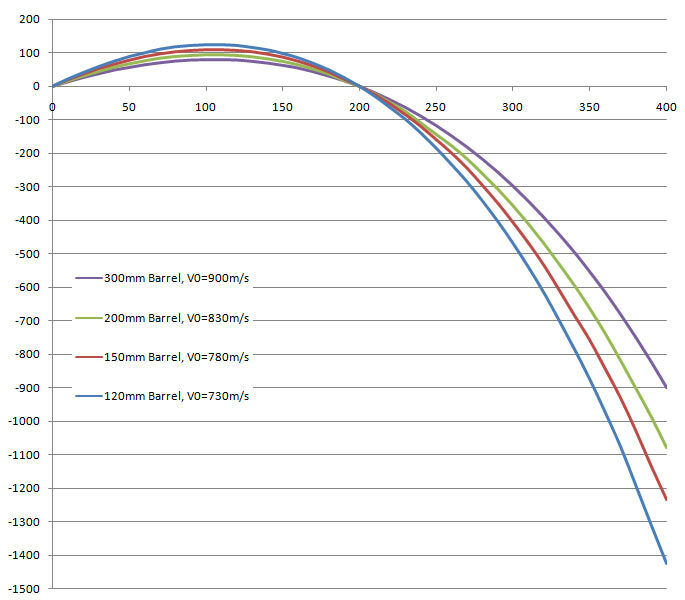 Several tests have been conducted with the 6.5x25 CBJ ST and the conclusion is that the precision is comparable to the 6.5x25 CBJ Ball. Examples of typical hit patterns can be seen on the 6.5x25 CBJ Ball page.